Vitamin B12 helps the body use fatty acids and amino acids and is therefore necessary for a healthy metabolism and energy. In addition, this vitamin helps the body make new red blood cells and it is necessary for both nervous system functioning and DNA synthesis. And though it is water-soluble, vitamin B12 is stored in the liver for years. 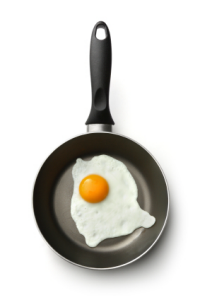 WHAT FOOD CONTAIN VITAMIN B12? Vitamin B12 is naturally found in a wide variety of animal-based foods including meat, poultry, shellfish, eggs and dairy products. Vitamin B12 is also added to some plant based foods such as fortified soymilk. However, this vitamin is better absorbed from animal-based foods as opposed to fortified plant-based foods. A deficiency in vitamin B12 affects 1.5-15% of the population. Pernicious anemia, an autoimmune disease that affects the lining of the gastrointestinal tract resulting in failure to produce a protein that is essential for B12 absorption, is the top cause of vitamin B12 deficiency. About 1-2% of older adults develop pernicious anemia though this disease can occur in many others as well and certain diseases raise one’s risk of developing pernicious anemia. Vegans and vegetarians who do not consume vitamin B12 fortified foods or take supplements have an increased risk of developing a B12 deficiency since this vitamin is primarily found in animal-based foods. Despite several potential contributing factors, in many instances the cause of B12 deficiency is unknown. Over time and when left untreated, low levels of vitamin B12 could lead to nerve damage. While blood tests can detect a vitamin B12 deficiency, consuming very large amounts of folic acid can not only mask the damaging effects of a B12 deficiency, high levels of this vitamin can exacerbate the anemia associated with a B12 deficiency and make cognitive symptoms worse. Therefore, total intake of folic acid from both fortified food and supplements should not exceed 1,000 mcg unless otherwise directed by a physician. Because vitamin B12 is found in many animal products and it is fortified in other foods such as breakfast cereals, nutrition bars and shakes, it is easy to get enough of this vitamin through a varied diet. However, some people may need supplemental vitamin B12 or feel better about ensuring adequate vitamin B12 intake by taking a multivitamin. 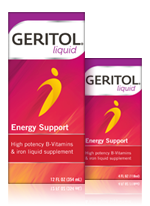 For this reason, Geritol® liquid multivitamin contains important B vitamins including 110% of the RDA for vitamin B12 (6.7 mcg). Pernicious anemia. PubMed Health, NIH. Retrieved from: http://www.ncbi.nlm.nih.gov/pubmedhealth/PMH0001595/ February 22, 2013. Vitamin B12. PubMed Health, NIH. Retrieved from: http://www.ncbi.nlm.nih.gov/pubmedhealth/PMHT0014185/ February 22, 2013. Dietary Supplement Fact Sheet: Vitamin B12. Office of Dietary Supplements, NIH. Retrieved from: http://ods.od.nih.gov/factsheets/VitaminB12-HealthProfessional/ February 22, 2013. Vitamin B12 in Dietary Reference Intakes: The Essential Guide to Nutrient Requirements (2006). Food and Nutrition Board, The National Academies Press. Retrieved from: http://www.nap.edu/openbook.php?record_id=11537&page=189 February 22, 2013.